The Custom Shapes Stage is used to create a wide variety of unique shapes for your design including upright arches, ramps, roof pieces, and more. Custom shapes are created using the drawing tools. Much of the work on this stage is done in the 3D view. Shapes drawn in the 2D view can be tilted upright on the axis in the 3D view. This allows an upright arch to be drawn flat and then tilted up. 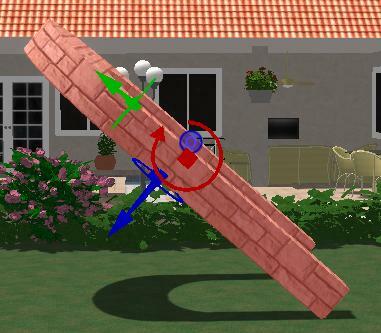 Unique objects are created in the Custom Shapes Stage by drawing them first in 2D and then tilting them up with the rotate tool in 3D. First use the regular Pool Studio tools to draw a flat shape in 2D. Once the shape is complete, set the Height under Stage Options to 1 foot. In 3D, use the Rotate tool on the shape. This will allow you to tilt the shape up. When you have the rotate tool selected, rotating arrows will appear on the 3D gizmo. 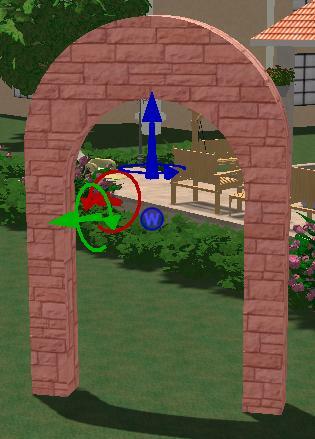 These guide arrows make it easy to see which direction each arrow of the 3D gizmo will rotate the shape. The alignment button in the center of the 3D gizmo allows you to change the orientation of the arrows between world or object alignment. Using the rotate tool will allow you to bring a shape from flat on the ground to standing straight up. The shape will rotate with regard to your settings under Snaps and Constraints. 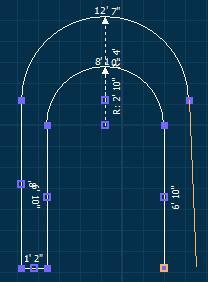 When creating custom shapes it is important to understand how Height and Elevation relate to your shape. The height is the thickness of the object while the elevation is the distance the object is above the ground. Height: The Height control is located under Stage Options. To set an object’s height, enter a number into the Height box or use the up and down arrows. For custom shapes, height represents one of the dimensions of the object. When creating an object such as a balcony or an upright arch the height is the thickness of the object. For example the height of a balcony would usually be 6 inches, representing the thickness of the balcony. The height may also represent the width of the object. For example, ramps are often created by drawing a flat triangle and tilting it upright. In this case the height of the ramp would be 3-4 feet representing the width across the face of the ramp. With some custom shapes, the height will represent the length of the object. Cylinders are created by first drawing a circle and then setting a height to represent the length. A 5 foot long cylinder would be created by drawing a circle and giving it a height of 5 feet. 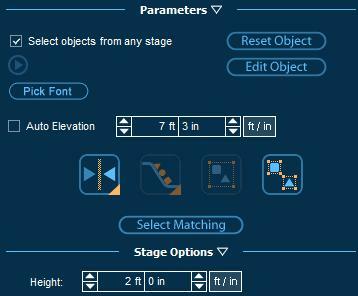 Elevation: A custom shape’s Elevation may be set manually under Parameters, but more often the elevation is changed by selecting the object in 3D and moving it with the 3D gizmo. For custom shapes, elevation represents the position of the object, specifically the distance between the object and the ground. An elevated object is floating in the air above the ground. 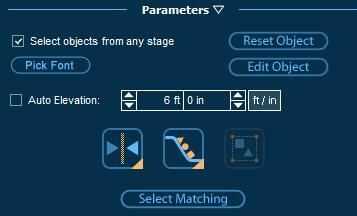 You may manually set the elevation of a selected custom shape by using the controls under Parameters. When checked, the Auto Elevation box will plant the custom shape on the ground. With the box unchecked, you may manually enter an elevation into the Elevation Box. The higher the elevation, the higher the object will be above the ground. A negative elevation will place the object below the ground. Please note, elevation is measured from the bottom of the object. For example, the top of an object that has a height of 14 feet and an elevation of 10 feet will be 24 feet above the ground. Along the same line, an object with a height of 10 feet and an elevation of -8 feet will appear 2 feet tall in the design. 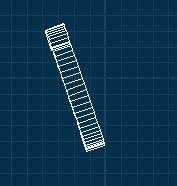 By default, the 2D view shows a top down view of all objects. Therefore, only the top of objects that have been titled straight up will show. Reset Object: Pressing this button will reset the shape back to its original state before being rotated. Edit Object: This button will temporarily reset a shape back to its original state to allow you to edit it. Pressing the button again will rotate it again.